Andorra is a tiny country in south western Europe, located in the eastern Pyrenees mountains and bordered by Spain and France. Once isolated, it is currently a prosperous country mainly because of tourism and its status as a tax haven. The people of Andorra are currently listed as having the highest human life expectancies on Earth, at 83.52 years (2007 est). Andorra is 466 km² and their capital city is Andorra la Vella. Andorra is not part of the European Union but it uses the Euro as its currency. Tradition holds that Charles the Great (Charlemagne) granted a charter to Andorran people in return for their fighting the Moors. Overlordship of the territory passed to the local count of Urgell and eventually to the bishop of the diocese of Urgell. In the eleventh century a dispute arose between the bishop and his northern neighbour over Andorra. Given its relative isolation, Andorra has existed outside the mainstream of European history, with few ties to countries other than France and Spain. In recent times, however, its thriving tourist industry along with developments in transportation and communications have removed the country from its isolation. Its political system was thoroughly modernized in 1993, the year in which it became a member of the United Nations. Andorra is in the Pyrenees mountain range. Andorra consists predominantly of rugged mountains of an average height of 1996 meters with the highest being the Coma Pedrosa at 2946 meters. These are dissected by three narrow valleys in a V shape that combine into one as the main stream, the Valira river, leaves the country for Spain (at Andorra's lowest point of 870 m). The Andorra surface is 468 km². In Andorra there are about 85,000 people. The majority of the inhabitants of Andorra are foreign nationals, only 33% are actual Andorrans. The others are almost entirely from Spain and France. Even so, the only official language is Catalan, a language spoken in the north of Spain, and, like Spanish, English, and French, is of Latin Origin. Andorra's long history has provided it with a rich folklore and an abundance of folk tales, with roots originating as far as Andalusia in the south and the Netherlands in the north. 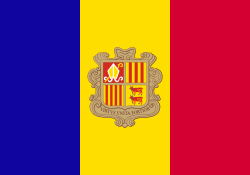 Today the majority of people in Andorra are Christian, mostly Roman Catholic. Andorran culture is Catalan in essence. It has given a significant and easily identifiable contribution to the conglomerate of Catalan culture. Andorra is popular with tourists who visit during the winter for skiing holidays and all-year-round for shopping trips - popular because of the price and tax differences between Andorra and neighbouring Spain and France. Andorra has one UNESCO World Heritage Site: Madriu-Claror-Perafita Valley.